There are an impressive selection of public parks and pretty gardens that greet visitors to Stockholm, allowing you to enjoy recreational spaces, pleasant green surroundings and Swedish flora. Ralambshovsparken is amongst the top parks in Stockholm and boasts excellent facilities and plenty of summer entertainment, along with ice cream kiosks and even free aerobics. Further parks lie just outside of central Stockholm, such as both Bishop's Isle (Biskopsö) and Bear Island (Björnö), where many coastal attractions await. Although the city's gardens and parks are at their most appealing during the summer days and balmy evenings, they do take on an entirely different character in the winter, when some even offer ice skating and other seasonal activities. 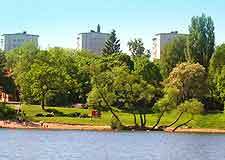 Bellevueparken can be found on the southern coastline of Brunnsviken, within the Vasastan area of Stockholm. The park boasts a number of interesting features, including a prominent statue of local Swedish artist and playwright, August Strindberg, who was born here in 1849. This statue has become a much photographed sight. The gardens at Bergianska Trädgarden are particularly historic and known to date back as far as the latter part of the 19th century. Many notable 'garden rooms' are present here, with themes including vegetables, formal plantings and even an oriental flavour from Japan. 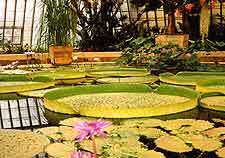 The exotic plants within the ornate greenhouses are a definite highlight. Sited on the very outskirts of Stockholm and brimming with native Swedish flora and fauna, Biskopsö is the perfect place for nature lovers. Expect to discover dense wooded areas, and everything from occasional deer to local seals, which can often be observed swimming and playing in the surrounding waters. Bear Island, known locally in Stockholm as Björnö, is known for its ancient relics and remains, many of which date back literally thousands of years. Amidst the history, archaeology and wildlife, Bear Island is also home to some truly outstanding views and great beaches, where it is possible to paddle and swim. 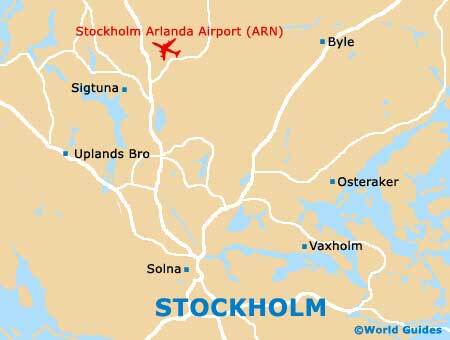 This pleasant park offers a truly tranquil space, away from Stockholm city life and all of the hustle and bustle. Many secluded seats are sprinkled all around the park, with other attractions include hot refreshments, regular barbecue events, a play area for children, and open-air performances by the city's acclaimed Park Theatre organisation. Tourists will know the Kungsträdgarden better as Stockholm's King's Garden and this green space affords itself to an array of recreational and seasonal activities. Outdoor entertainment, including concerts, are fairly commonplace here during the summer months, while in the winter, ice skating becomes a major draw card. Without doubt one of the most popular parks in the whole of Stockholm, Ralambshovsparken soon fills up when the sun comes out and is a popular spot for the local Swedes. 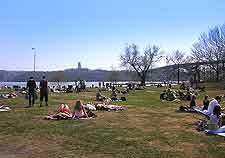 People come here to picnic, sunbathe, play ball games, to have a cooling swim, watch open-air theatre or simply to enjoy an ice cream. The Spökparken lies within the Vasastan area of Stockholm and is named after the Spökslottet castle, which was constructed here more than 300 years ago. Today the park features a fragrant herb garden, many pathways and mature trees, adding plenty of character and shade.